For the past few days I've been under the weather and needed to make a large batch of something nutritious that my family could eat for a few days. Either for a meal or snack. It needed to be an easy recipe sense yours truly could hardly lift a finger, let alone a spatula! 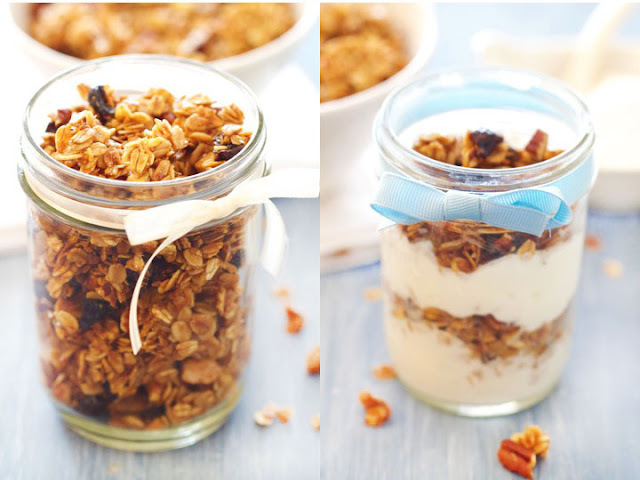 Granola is an easy food that can be dressed up for a fast simple meal. Add yogurt, milk and berries...voila! A healthy, satisfying breakfast or lunch. 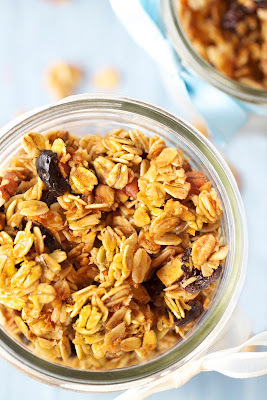 If you are not familiar with making granola, it's super easy! About a 10 min prep time and a 20 min cook time. Couldn't be easier! My favorite dried fruit with granola is morello cherries. They give a nice tart taste to the sweet crunchy granola, although any dried fruits would compliment it nicely. When you take your granola out of the oven, don't be surprised if it's still a bit wet and sticky. This is normal. It'll harden up after 10 minutes. The longer you cook the granola and the darker brown it gets, the crunchier the bite! I leave mine a little longer in the oven, since I like mine a bit crunchy! Preheat oven to 350 degrees. Lightly coat a baking sheet with vegetable spray. Combine oats, pecans, almonds, cherries, cinnamon, coconut flakes and salt in a bowl. Set aside. In a small saucepan over medium heat, add vegetable oil, honey, brown sugar. Stirring occasionally, bring to a boil and remove from heat. Add the vanilla and stir until incorporated. Pour sugar mixture into the oats, using a wooden spoon, stir until all oats have a glossy coat. Pour granola onto prepared baking sheet and spread evenly. 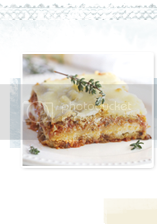 Bake, stirring occasionally, until it reaches a nice golden brown color (20-30 minutes.) Let granola cool completely and break into chunks. Store in an airtight container. Oh this looks so easy. I have yet to attempt my own granola, but this weekend might be it. Granola is one of those things that I crave for dessert rather than breakfast. This recipe is good for both. Looks so yummy! Love the photos! Beautiful!!! 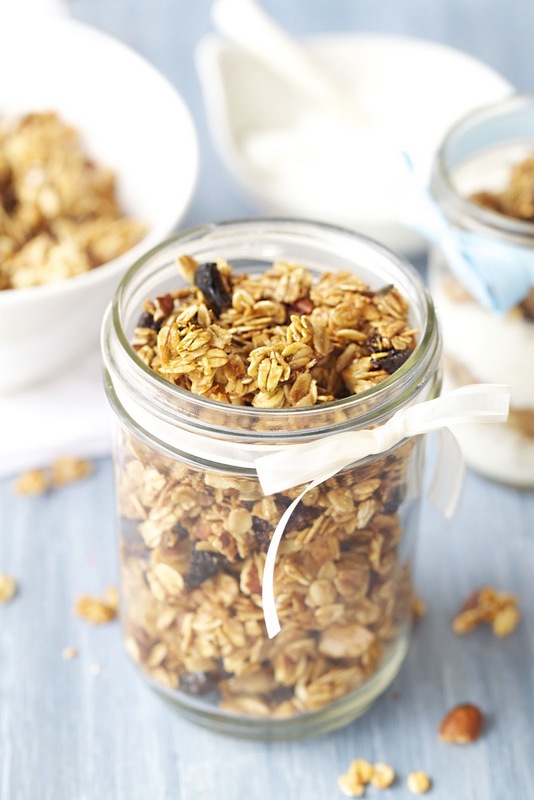 Homemade granola is the only way to go, and I love how you can customise it. I love homemade granola! its a great healthy snack. lovely clicks too! I had to make this. SO good! I posted it with a link to you. 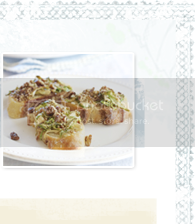 You'll see it through foodbuzz if you'd like to take a peek. Thanks for inspiring me to make this. Simply stunning!